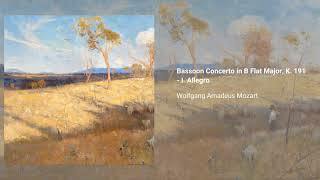 The Bassoon Concerto in B flat major, K. 191/186e, written in 1774, is the most often performed and studied piece in the entire bassoon repertory. Nearly all professional bassoonists will perform the piece at some stage in their career, and it is probably the most commonly requested piece in orchestral auditions – it is usually requested that the player perform the excerpts from concerto's first two movements in every audition. Although the autograph score is lost, the exact date of its completion is 4 June 1774. Mozart wrote this (his first concerto for a wind instrument) when he was 18. Scholars believe that Mozart wrote perhaps three bassoon concerti, but that only the first has survived. The concerto calls for a solo bassoon and an orchestra consisting of 2 oboes, 2 horns in Bb, violin I/II, viola, and cello and double bass. The second movement contains a theme which was later featured in the Countess's aria "Porgi, Amor" at the beginning of the second act of Mozart's opera Le nozze di Figaro.